This handbook is packed with highly practical advice to help trainers ensure their training materials are as effective as possible. 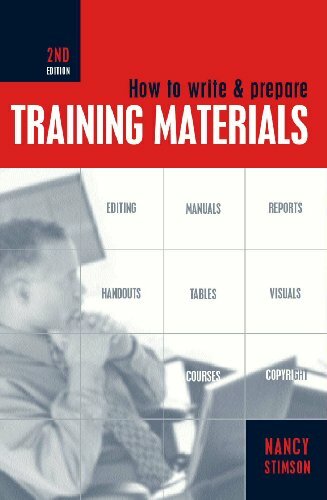 Clearly explaining the essential techniques to employ when writing and preparing all types of training materials - whether handouts, reports, structured courses or material for use online - the book gives proven tips for improvement. Covering all aspects of the written word relating to training, the book covers: Manuals, Forms and Questionnaires, Course Notes and Handouts: Course Visuals: Self-learning Texts, Reports, Memos and Minutes, Tables and Charts and also has helpful information on copyright issues, data protection implications, editing and punctuation. Your Employees and How to Write and Prepare Training Materials (both published by Kogan Page). How much does presentation matter? Are exercises the easy option? Why should you write self-learning texts? Why bother about a Web site? 'Grammar is bunk'--but is it?